Millions of Americans are overweight, obese or just have extra weight around their mid-sections. Belly fat, or what is also known as visceral fat, can lead to multiple health problems including, heart disease, type 2 diabetes, cancer and Alzheimer’s disease. Let’s face it belly fat is down right dangerous for your health and it is time you did something about it. The new book, “Belly Fat Diet For Dummies,” by nutrition and fitness expert Erin Palinksi-Wade explains how making simple lifestyle changes can help you quickly shed belly fat and take control of your health. “Belly Fat Diet For Dummies,” begins by defining what belly fat is and why it is so harmful to your health. “Even if you’re at a relatively healthy body weight, holding excess fat in your abdominal area causes you to have an increased waistline and thus be at a much greater risk of health complications,” Palinksi explains, “a comprehensive European study found that every 2-inch increase in your waistline increased mortality by 13 percent in women and as much as 17 percent in men.” Even people at a healthy weight may have too much belly fat. Most people who have dieted understand what BMI (Body Mass Index) is and why it is important to have a lower BMI. However, did you know that even if your BMI determines that you are at a healthy weight you could still be at risk for health complications if your waist circumference and waist-to-hip ratio is too large. “Belly Fat For Dummies” contains easy to follow steps including diagrams on how to accurately measure your waist circumference and determine your body type. Making changes to your diet and exercising properly are a couple of steps you must take in order to flatten your tummy. “Belly Fat for Dummies,” outlines what foods are the leading causes of increased belly fat, what foods you should eat in order to maintain a healthy waistline, how stress contributes to belly fat, proper exercises to decrease belly fat, and delicious healthy recipes that will help you tone your tummy. Most Americans have a little extra weight around our mid sections. If you are new to dieting, are unsure if you have an unhealthy waistline or have tried lots of different diet plans but didn’t get the results you expected you must read “Belly Fat Diet for Dummies.” This book is suitable for both men and women and will certainly help new moms lose the baby weight. 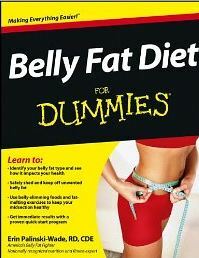 You can purchase “Belly Fat Diet For Dummies” at Amazon.com or at your local bookstore. *Disclosure: I received a copy of “Belly Fat Diet For Dummies,” in exchange for this review. All opinions are accurate and 100% mine.